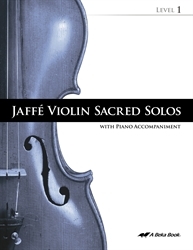 Your child can perform solos for fun, with this piano accompaniment book and CD for select songs from Jaffe Violin Series—Pray, Sing, Play Method Level 1. These 12 hymns, all with accompaniment, will provide variety in your child’s performing. He will be able to apply what he is learning in a performance setting and enjoy making music! A CD is provided so he can hear what the songs sound like with accompaniment. A removable booklet of just the violin part is inserted in the book to make performance easier for both violinist and pianist. Piano parts include the violin part as well. Gr. 4–12.